Americans are more likely than ever to get news from multiple social media sites, according to a recent Pew Research Center report. About a quarter of all U.S. adults (26%) get news from two or more social media sites, up from 15% in 2013 and 18% in 2016. But there is considerable variation in the extent to which each site’s news users get news from other sites, and which sites those are. Facebook claims the largest share of social media news consumers, and its news users are much more likely to rely solely on that site for news. Just under half (45%) of U.S. adults use Facebook for news. Half of Facebook’s news users get news from that social media site alone, with just one-in-five relying on three or more sites for news. 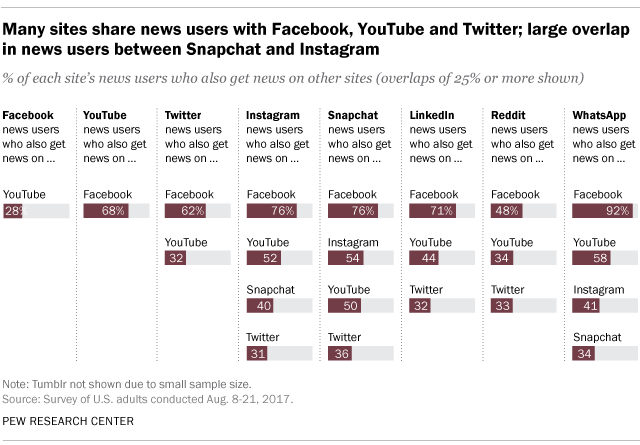 In general, sites with a smaller number of news users also tend to have the most overlap with other social media sites for news. However, Reddit stands alone in having a small but more exclusive audience of news users. Only 4% of U.S. adults get news from this site, and of these users, just 38% use three or more social media sites for news. Finer differences emerge in which sites share news users. 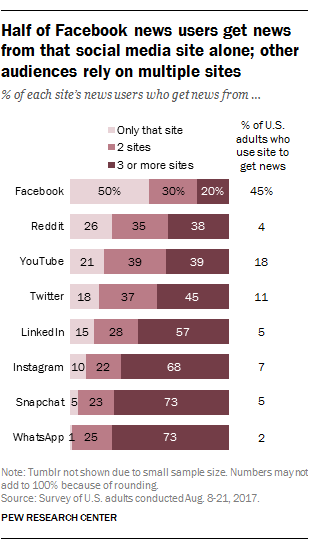 Looking at sites that share at least 25% of their news users with another site, audience overlap most commonly exists among news users of smaller sites who also visit Facebook and/or YouTube for news, the two sites with the most news users overall. About half or more news users of each of the other sites studied also get news on Facebook, while about a quarter or more overlap on YouTube. Four of the sites have considerable overlap with Twitter: Roughly a third or more of news users of Instagram, Snapchat, LinkedIn and Reddit also get news on Twitter. Beyond Facebook, YouTube and Twitter, there is less widespread overlap in news use with the other sites. However, news users of Instagram and Snapchat have considerable overlap with each other, and at least a third of WhatsApp news users also get news from both of these sites, even though a relatively small share of the population uses these sites for news. Only a small portion (less than 25%) of any of these sites’ news users also gets news from Reddit, LinkedIn, WhatsApp or Tumblr. U.S. adults who get news from multiple social networking sites are more likely to be nonwhite and younger. About half (47%) of news consumers who rely on two or more social media sites for news are nonwhite (including Hispanics), compared with about one-fourth (26%) of those who use just one site. They are more likely to be under age 50: 77% are 18-49 compared with 56% of those who use just one site for news. Additionally, they are twice as likely to be ages 18-29 (37% vs. 18%).